“Why are some legislators so afraid to allow North Dakota voters to decide what is in their constitution?” asked an earlier editorial in the Fargo Forum. Legislation to make citizen petitions far more difficult abounds in North Dakota, this being the winter of legislators’ discontent, because the mighty solons did not like an ethics measure that voters nevertheless passed in a close contest last fall. Personally, I would have voted against Measure 1 . . . and there are other measures that have passed and will pass through the citizen initiative process that I oppose. But no bad vote constitutes a legitimate reason to smash these critical democratic checks we can exercise to maintain some level of citizen control over government in roughly half the states and more than half of America’s cities and towns. Now legislators are launching legislative torpedoes against the voters: requiring more voter signatures, slashing the time available for citizens to gather the necessary signatures on petitions, all manner of sneaky little regulations and rules to trip up the very people our civics book says government is meant to serve. Of course, these attacks are not at all limited to the Peace Garden State. Nor are they rare; they’re almost routine. Michigan’s legislature enacted legislation to make their ballot initiative process more difficult in last December’s lame-duck session. Arkansas politicians have been stabbing at the initiative with ever-more draconian rules and regulations for years, and they’re back at full-swing this session. On a recent trip to the Missouri capitol, I heard elected officials privately contend that voters deciding issues directly — without going through the legislature — was a “bastardization” of our republic. Perhaps they had all fallen and collectively hit their heads, suffering amnesia, forgetting that in these United States, a free republic, “The people are the only legitimate fountain of power.” It is as if these otherwise fine people thought that the degree of power to be given the people was a decision for them to make, as opposed to the reverse. Hope they remember their glasses. Consider Idaho’s Senate Bill 1159, which would hike up the signature requirement from 6 to 10 percent of registered voters, a 67 percent increase. It would make Idaho the most difficult requirement in the nation. The bill would also reduce by two-thirds the time allowed for petitioning. The legislation’s real-world affect? To silence Idahoans and end their independent involvement in government by killing their ability to effectively use the initiative and referendum process. But it is not really very odd at all. Legislators are people, and people too often put their own self-interest before the interest of others and before the public interest. Especially in the case of initiative and referendum, when it comes to voters having a direct democratic check on a legislator’s power. Or even when voters don’t actually possess a check on power, but merely an opportunity to speak up to power. A successful statewide ballot initiative sponsored by Tim Eyman and Voters Want More Choices offered one such method, mandating advisory votes. 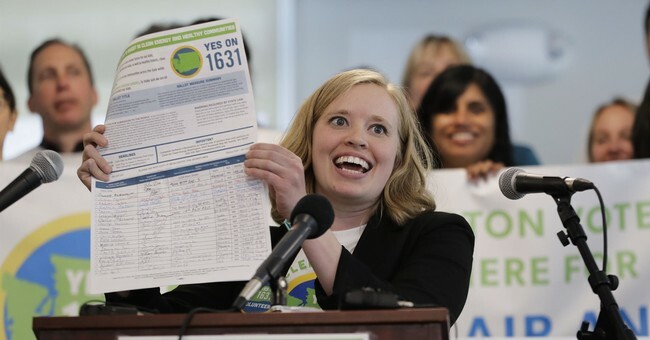 Washington State’s electorate has now weighed-in at the ballot box to express approval or disapproval for the last 19 tax increases enacted by legislators. In fact, these advisory tax questions sometimes garner more votes than races for superintendent of public instruction and the state supreme court, for instance. The results? Mixed. Seven times voters in this blue state have favored the tax hikes, while they opposed the other 12 increases. No . . . apparently. Washington state politicians don’t really want to know what voters think. And I suspect that the issue of taxes tops their list of reasons to embrace a no-voting-on-that policy. Earlier this month, due to several big-government Republicans slipping over to the Democrats, Senate Bill 5224, getting rid of these pesky advisory votes and thereby stopping voters from officially expressing their will on taxes, passed the Senate. In testimony on the bill, Mr. Eyman reminded legislators that voters had four times mandated advisory votes on tax increases (2007, 2010, 2012, 2015); had six times voted to require a two-thirds legislative majority to raise taxes (only to have those measures overturned in court); and that legislators had routinely prevented citizens from using the state’s referendum process by attaching phony emergency clauses to their tax hikes. In the land of the free and the home of the brave . . . a crumb, anyone?